“Wisdom is better than jewels, and all that you may desire cannot compare with her” (Prov. 8:11). To be wise is to skillfully apply knowledge in everyday life. To be wise is to mimic God, who applied his knowledge in making all things: “O Lord, how manifold are your works! In wisdom have you made them all” (Ps. 104:24). The ultimate application of God’s knowledge was in his plan of redemption for us by Jesus Christ—a plan that is, sadly, foolishness to the world (1 Cor. 1:18–31). This all-surpassing wisdom is supremely found in Jesus Christ himself, “in whom are hidden all the treasures of wisdom and knowledge” (Col. 2:3). And because we as believers are in Christ, he “became to us wisdom from God” (1 Cor. 1:30) so that we can say in truth, “But we have the mind of Christ” (1 Cor. 2:16; cf. Phil. 2:5). As God’s newborn and adopted children, he calls us to the cultivation of his wisdom in our daily lives—in thoughts, words, and deeds. And because this is our calling, the world around us assaults us with it’s own “wisdom” that it seeks to put in the place of God’s wisdom. Our own sinful nature, the “flesh,” strives against this wisdom, calling us to rest in our own abilities and plans. And the devil himself, our archenemy, uses every means at his disposal to get us from not only learning God’s knowledge but also applying that in our interactions with the world and each other as brothers and sisters in the body of Christ. 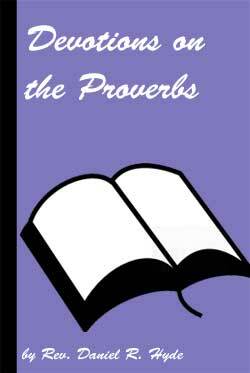 The following devotions through the Proverbs were produced as a weekly guide for the benefit of the Oceanside United Reformed Church. They are intended to assist you in reading through the Word daily and systematically. Because many of us have little children and because many of us have difficulty with finding the time necessary to read the Word, the readings are intentionally short. Far too many of us start every year with the best intention of reading through the entire Bible, only to forget or become discouraged soon after, leading us to stop completely. With short readings, then, I intend to help you be in the Word regularly with manageable portions. Along with each reading I have also added a verse or verses to meditate on throughout the day. Highlight these in your Bible; try to memorize some of these; recite them as you drive in the car. I have also added brief bullet points under each reading as a way to stimulate personal and communal thought and discussion.